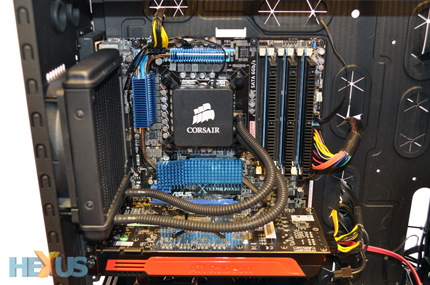 Installing a Hydro H50 or Hydro H70 cooler proved to be a cinch, but Corsair's managed to make it even easier with the Hydro H60. Doing away with the circular retention bracket employed by previous models, the Hydro H60's pump is installed in a manner not too dissimilar to most high-end air coolers. 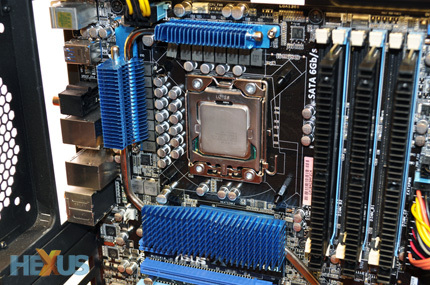 On our ASUS X58 motherboard, it's a simple three-step process. 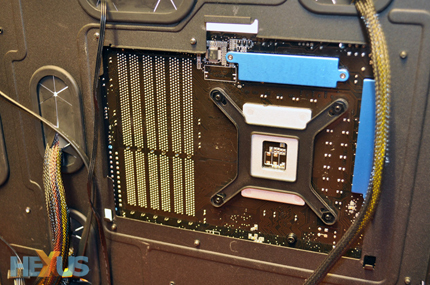 1) Attach the backplate to the rear of the mainboard. The bracket's four threaded nuts are adjustable, making it compatible with a choice of Intel sockets. 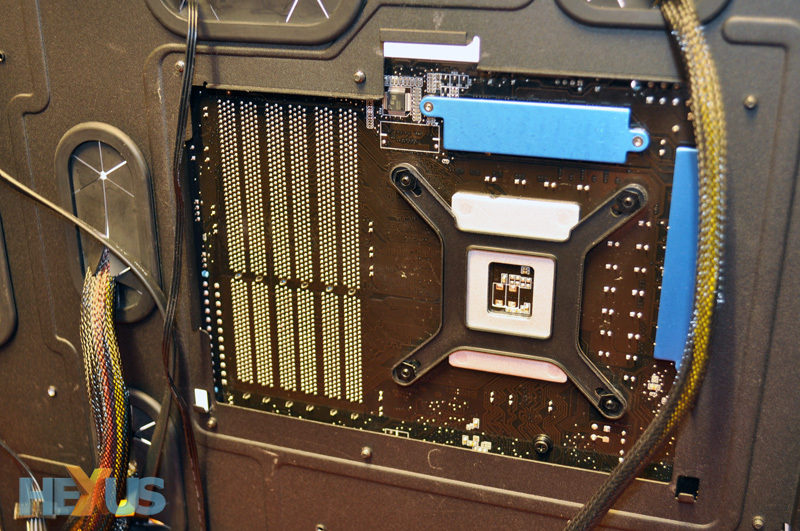 This step's easier if your chassis has a reasonably-sized cutout in the motherboard tray, of course. 2) Secure the backplate using the four double-ended standoffs supplied in the box. These don't need to be ultra-tight, so put your black and decker away and secure the old fashioned way - via forefinger and thumb. 3) Slip the pump's four arms onto the threaded standoffs and secure using the four bundled nuts. That's the bulk of the installation complete, and while you're putting it together you do appreciate the little extras that help simplify the process. The H60 pump's copper base has a neat layer of thermal paste pre-applied, and the FEP tubes swivel to help ease the positioning of the rad. The 120mm fan/radiator ensures compatibility with most chassis, and Corsair's pre-sealed tubing is long enough to allow for comfortable installation to the rear or top of our Obsidian Series 800D chassis. 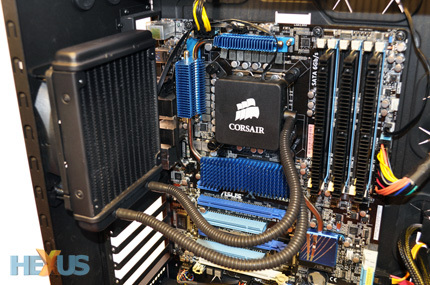 As with all existing Hydro Series coolers, Corsair recommends orientating the radiator fan to pull air from the outside in, and if you've got overclocking in mind, the radiator is threaded on both sides to allow for a second 120mm fan to be attached in a push-pull configuration. The fan direction may seem backward, but the idea is to ensure that the delta between the air temperature and radiator temperature is maximised. That makes sense, but you might want to reconfigure your chassis fans to provide an exhaust elsewhere. We've found that a combination of a front intake, a rear intake and a top exhaust works particularly well. Once the fan and pump are installed, both need to be attached to a power source via four-pin and three-pin headers. The fan can be hooked up to a fan controller to keep speeds and noise in check, but it's recommended to have the pump's three-pin header hooked up to a continuous 12V supply. There's also a two-pin connector hidden to the side of the pump that serves no immediate function but will one day be able to hook up to a Corsair Link controller for software-based monitoring of your system's vitals. Installation's a doddle, and with the Hydro H60 in place, you're left with a very tidy-looking system and plenty of room around the CPU. The pump places a lighter load on the motherboard than most high-end air coolers, and though it's personal preference, we reckon the self-contained liquid cooler looks considerably more elegant, too. But you aren't planning on forking out £60 just for appearance's sake, are you? Let's find out how well the H60 can cool.